The RAM-B-316-1-UN11U consists of the RAM POD I universal No-Drill® vehicle base, 18" rigid aluminum rod, socket system and universal X-Grip® clamping cradle for 12" tablets. The base of the mount connects to your seat rail without any drilling necessary. The 18" rigid aluminum rod can be bent to position your device to its optimum viewing location. The X-Grip® clamping cradle consists of a composite spring loaded cradle, expandable grip arms and additional bottom support keeper. Included are extra easy access grip knobs, located on the back of the cradle for quick release of your tablet. 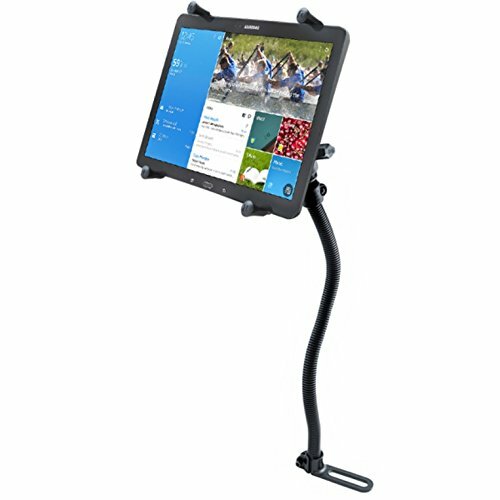 The X-Gripclamping cradle expands and contracts for perfect fit of most 12" tablets with or without sleeves, as well as some smaller tablets. Please verify dimensions of your tablet below for compatibility with the X-Grip®.